Parnell Square Cultural Quarter will be a landmark destination which will complete Dublin City’s Civic Spine at its northern end. Parnell Square Foundation (Charity No. 20083182) was established to raise funds and finance the Project which is being developed by PSQ Developments Ltd. , a wholly owned subsidiary of Parnell Square Foundation. In the tradition of philanthropy in which Parnell Square was developed in the 18th Century, this Project is being supported by Dublin City Council, Kennedy Wilson and the Office of Public Works. Kennedy Wilson has agreed to provide seed capital to Parnell Square Foundation and assist PSQ Developments Ltd. pro bono with the development. Kennedy Wilson also proposes to undertake fundraising in Ireland and internationally on behalf of the Parnell Square Foundation. The Parnell Square Cultural Quarter Project structure is built on collaborative teams. Parnell Square Cultural Quarter Culture Group was established as the Parnell Square project working group. Its aim is to explore the totality of creative possibilities of the quarter. It is chaired by the City Librarian. 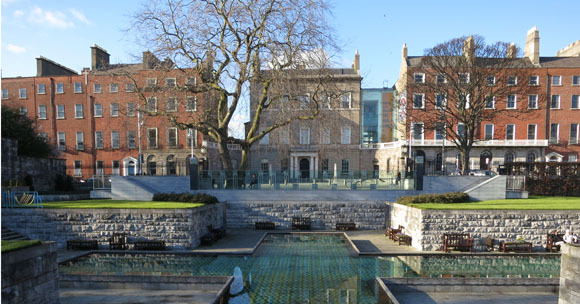 Its members are drawn from Dublin City Council departments including Libraries, The Arts Office, Dublin City Gallery The Hugh Lane, City Architect’s Department and the Culture, Recreation, Amenity and Community Department. Parnell Square Steering Group is the project board for the Parnell Square Cultural Quarter Project. It is chaired by the Project Sponsor, the Assistant City Manager of the Culture, Recreation, Amenity and Community Department. It provides oversight to the project and receives reports from the Project Working group. Work has commenced surveying the properties to house the new City Library and other cultural facilities at Parnell Square North. It is intended that Dublin City Gallery The Hugh Lane will form part of the overall Parnell Square Cultural Quarter offering and its role and impact will be expanded by the development of the new facilities. The project working groups are currently engaged in workshops with the successful Design Team, Grafton Architects and Shaffrey Associates, to interrogate the detailed spatial and functional project brief issued in 2014. The brief challenged the Design Team to create a beautiful City Library that presents a truly ensemble experience, a menu of opportunity – a visitor experience that connects services visibly, horizontally and vertically, moving between the Georgian houses and the new build spaces and providing points of intersection with Dublin City Gallery The Hugh Lane. They were asked to design a beautiful library, a place that Dubliners would flock to and enjoy, their City Library at Parnell Square, and we are delighted to share a selection of the draft sketch design images of the City Library. The Parnell Square Cultural Quarter is an ambitious project encompassing places for learning, literature, music, innovation and enterprise, inter-culturalism and design. The target date for opening of the new cultural complex is 2023. Consultation with the many relevant stakeholders will be central to this work. We want to ensure that the strategy is well coordinated with the existing infrastructure of the city and meets the needs of local communities, as well as national and international needs and ambitions.